...: The Fox is this weekend! The Fox is this weekend! My lovely friends Jen and Joanne organize the incredible Fox Fair every February. This is the 4th year now and it's one of my absolute favorite markets. The vendors are great, the music is fun and the energy the whole time is just so wonderful. I always get a little silly at markets, and I am guessing that since this will be my last face to face market before baby arrives, that I will be sillier than ever. I will not be packing chocolate covered almonds this year... our usual Power Pellet staple snack, because Terrible Truffles is a vendor this year! They make a cassis truffle in white chocolate that is my ABSOLUTE FAVORITE and I will be budgeting extra cash to eat a lot of them this weekend. 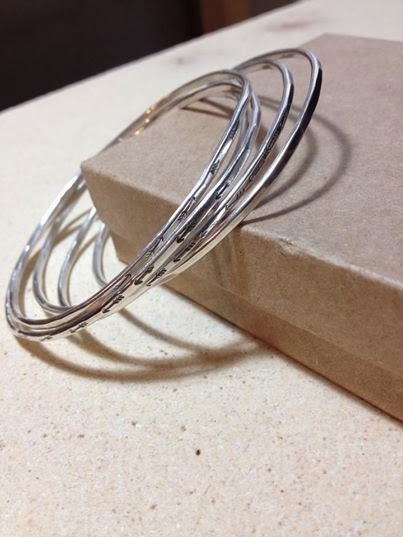 I am bringing some new bangles to this market, I ordered some new stamps that I am really excited about, a Bee, an Arrow, and a new Crescent Moon. Oh they are so sweet! I've made some new recycled charms with the new shapes, along with some more birds, and these new bangles! I'm not sure what to call them yet, it's just in time for Valentine's so they could be Cupid's Bangles, or Flight of Arrows?? Not sure what their name is yet, but they are pretty darn cute. 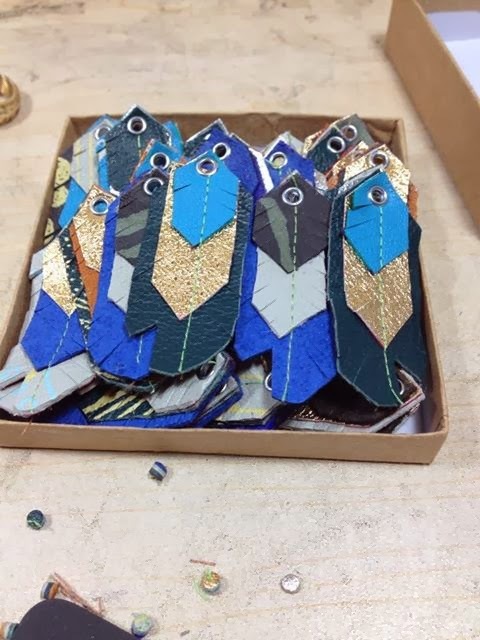 I'll be bringing 10 finished ones with me, as well as more Birdie Bangles. And new Leather Feather earrings! I've updated the shape and there are some new printed colours in there and I am working hard to not keep them all for myself. Which is ridiculous because there are something like 30 new pairs. 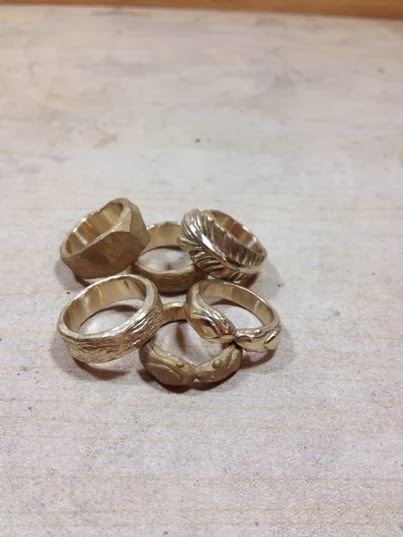 And I've got the new Bronze Cocktail rings on my bench getting cleaned up over the next couple of nights as well. I only have 8 of them, but they are pretty nice. If I do say so myself. Metallic Leather Torc style thing? 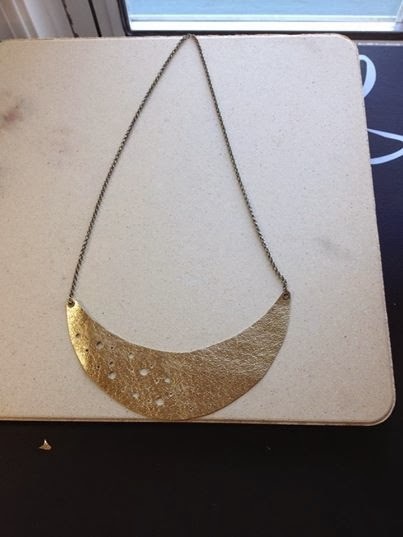 I think I might sell these ones extra reasonably, sample style, because I am not sure about the design totally. Come on down to the Fox this weekend and check out all this great new stuff! It's my last market for a while, and I would love to see your lovely faces there. I'll direct you to the Truffle booth, don't you worry my dears!